Meet the 2011 Redline 925. I’ve been testing this bike for the last few months and I’ve finally been able to compile my review below. 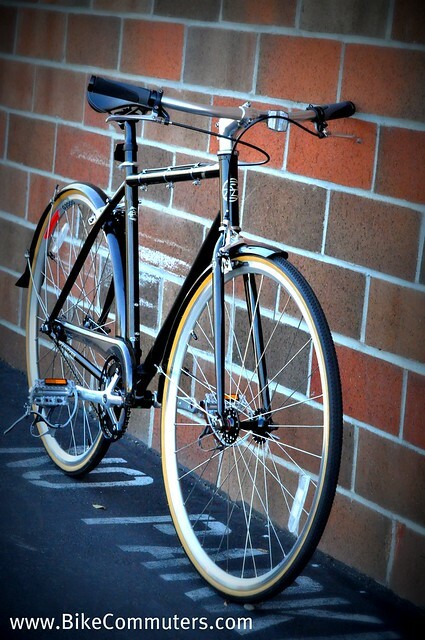 First impressions of this bike: beautiful styling, classic color mated with chrome and aluminum. Geometry provides a very comfy yet aggressive-ready ride (more on that later). The official name for the color used on the 925 is “Pearl dark brown.” Simply beautiful. Classic toe-clips with leather strap. No need for special riding shoes or pedals. Redline did a great job by pairing this bike’s color with aluminum and chrome parts which gives the bike a very distinguished look. Best stopping power I’ve seen on any commuter bike I’ve tested. 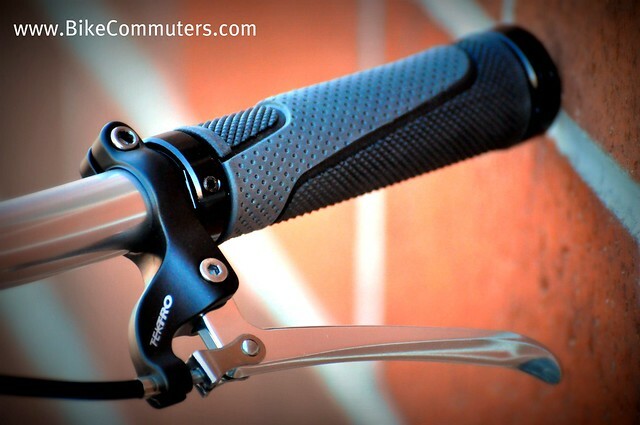 The Tektro Dual Pivot Caliper and Tektro New Alloy Flat Bar Levers can and will stop on a dime. 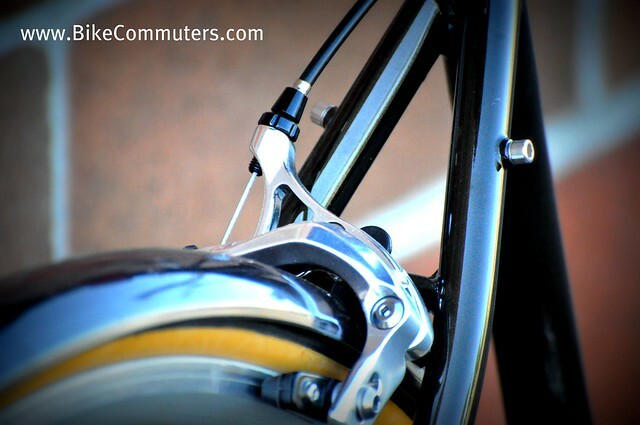 Fender mounts, radial laced wheel. The 2011 Redline 925 is a very smooth riding bike. 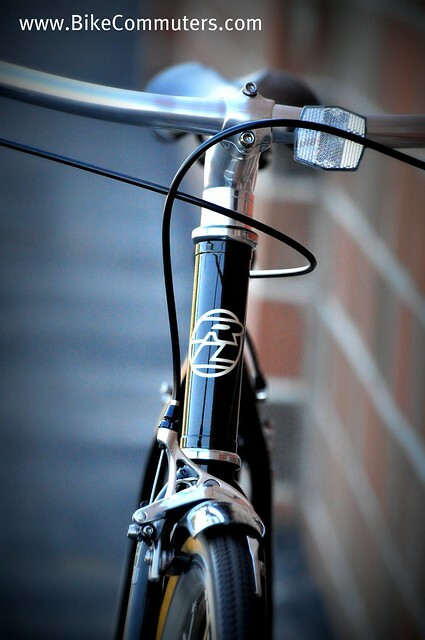 Aesthetics wise, its a gorgeous bicycle and what makes it great is that it meets many of our reader’s requirements when it comes to what a commuter bike should have; fenders, chain guard, rack mounts and simplicity. One of the things I enjoyed about the 925 is the geometry. The crescent handle bar provided me with the right amount of relaxed riding position. However, when I needed to sprint or get up and off the saddle for more power to the pedal, the bike is very nimble and responsive. During the testing period, I made sure I rode it through my pot-hole filled route and would, on occasion, jump the bike off curbs and over parking lot blocks. The wheels stayed true to their form. The frame took all the abuse that I presented and to no surprise, the bike rode as if it was brand new. It all comes down to this; I could not find anything wrong with the 2011 Redline 925. 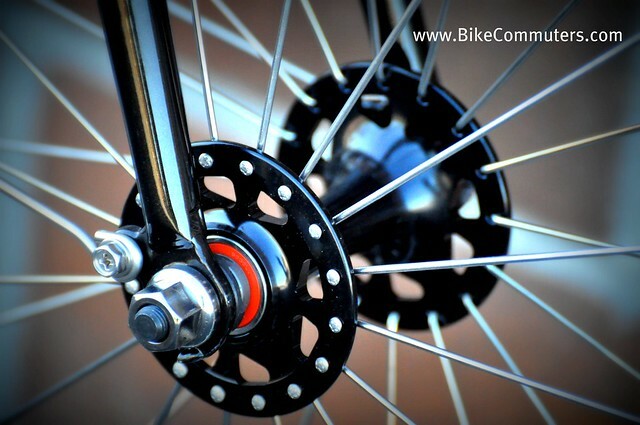 It is a well designed/built bike, the parts spec on it is perfect for commuting and I still can’t get over how awesome the stopping power is on this bike. I have to mention that we’ve reviewed a Redline 925 before, and fell in love with the bike back in 2007. For each year they release a new model, it just keeps getting better and better. In fact this bike has been a Staff favorite for the past few years. Still loving my ’09, but this looks pretty sweet! I would like to see metal fenders and chainguard in the future. 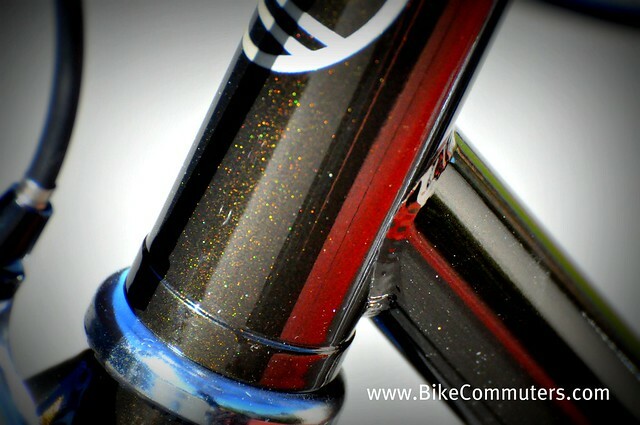 Any bike that comes with sparkle paint is a thumb’s up in my book! The 9-2-5 keeps getting better and better! I like it! Very stylish bike. Getting rid of the moustache bars was a good spec for Redline, IMHO. I agree — with curved citybars like the current model, it just “looks” right. Moustache bars are cool in theory, but I just can’t love ’em after trying a pair a couple years ago. I actually bought a 925 2 weeks ago and couldn’t be happier. It hanles the hills and potholes in San Francisco with aplomb! are those cable clamps on the top tube? @Harry — sure enough, those are cable clamps. 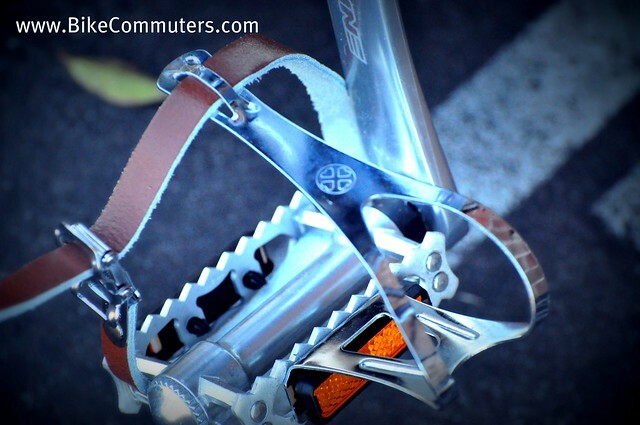 That way you can run this fixed without a rear brake and pop everything off without undoing the brake cable. My 26 mile commute would not allow for a single speed. But that is a purty bike-ah-cickle right there. I’m about 205 on a good day, and I love the 700c wheels, way smoother than 26″ wheels. I think you’ll be faster on your commute with this bike. 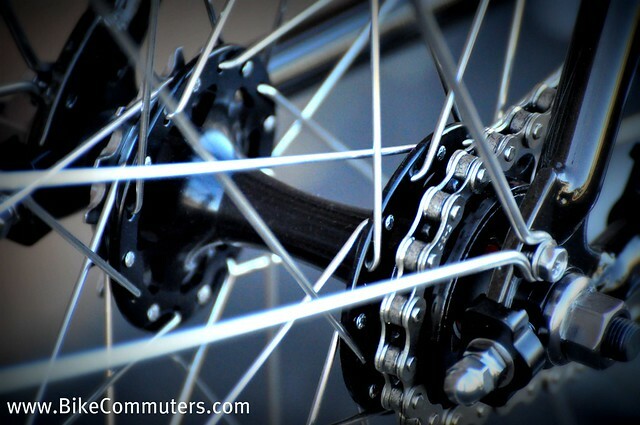 Personally I prefer 700c wheels over 26 for my commuter bikes. Old meets new or new meets old. That is a beautiful bike. It reminds me of an old bike my mom had many moons ago. Nice looking bike except for that ill-fitting chainguard. Is that for real or was it a preproduction thing? Whew. I am really excited about this bike. If the size 52 or 56 work for me tomorrow, I will be coming home with one. Can’t wait! Bought a Redline 925 2011 after reading this review. After riding the bike for around thirty miles started hearing a popping sound while pedaling. Discovered it was coming from the freewheel. 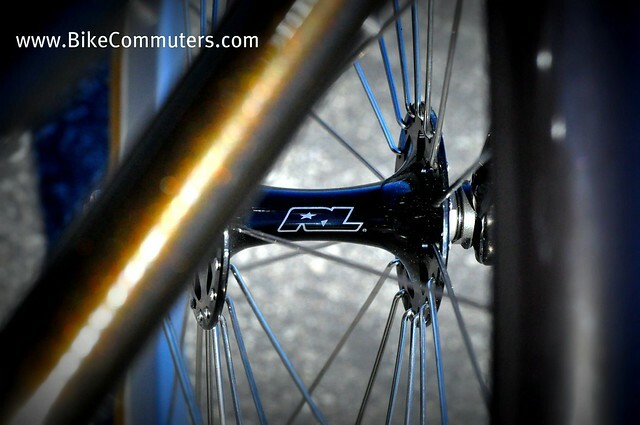 Now waiting to see if Redline will replace the freewheel with another cheap freewheel or upgrade to a better freewheel. Oh, I should end this comment on a positive note. 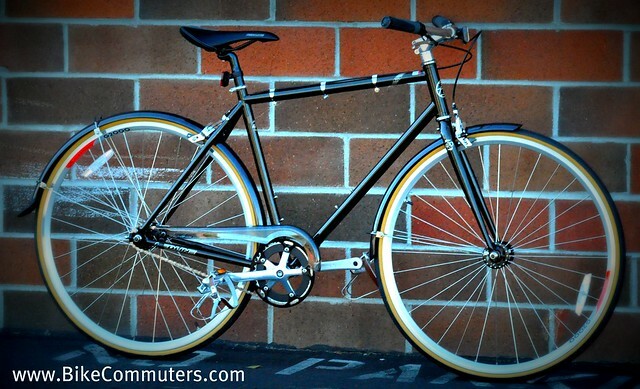 I’m impressed with the quality of the ride and how it handles a commuter load and climbs over bridges.